Crystal Silmi, a dark-haired beauty of Palestinian and Irish heritage, has become one of the leading lights in Northern California’s bellydance scene and has also forged a unique style of dance based on bellydance principles. In this exclusive interview, Crystal discusses her training, her development as a choreographer, and her recent decision to leave Santa Cruz, CA for a new adventure in Madrid, Spain. Crystal’s solo performances in raks sharki style are outstanding, but it is her electric fusion of bellydance, hip hop, jazz, rockabilly and whatever else inspires her that draws her fans back again and again. Whether dancing as a soloist or with her fusion company, RaksArabi, Crystal’s performances draw a crowd. Crystal studied and performed with the grand dame of contemporary American bellydance, Jamila Salimpour, and with her illustrious daughter Suhaila, and quickly became a teaching assistant to both. She performed with two Salimpour companies including Bal Anat which specializes in North African folkloric dance, and in Salimpour’s full-length bellydance ballet, “Sheherezade,” before she established her own troupe in 2006. She has performed as a solo artist in France, Taiwan, and Thailand and can be seen as a dancing extra in the feature film Sinbad, the Fifth Voyage, due out this year. Crystal has also developed into an inspiring teacher in her own right. She has taught at many Santa Cruz studios and her popularity ensures that her workshops—which are taught locally and nationally—are always sold out. Her vibrant, emotion-packed image graced the poster for Santa Cruz Dance, National Dance Week in 2008. In addition to her dancing credits, Crystal has a degree in cultural anthropology from the University of California, Santa Cruz, studied at Delhi University in India, and completed an intensive course of study in Persian language at University of California, Berkeley. She is an ardent and dedicated vegan, a photographers model, and claims to be married to Edward Cullens (of Twilight fame). Born in San Francisco of an Irish mother and Palestinian father, Crystal didn’t take up dancing until her twenties. I have no training as a dancer. I came from a very poor family. I always loved dance; always I felt like I had rhythm but I never had any training. I actually got really intrigued by Odissi—classical Indian dance—when I was in college because I was doing a lot of studying about South Asia and I was studying in India. I actually wrote my thesis on the devadasis of India but I never learned any classical dance. In 2000, after returning from her studies in India, Crystal had a hard time readjusting to American culture. In an effort to aid in her readjustment, a friend invited her to a Motion Pacific dance studio concert where they saw Rachel Brice perform. “And I was like, this really resonates with me. I want to do this.” She took classes with Brice (who herself went on to international fame as a tribal-style bellydancer) until Brice decided to move. She recommended Palika Bender as an appropriate teacher. 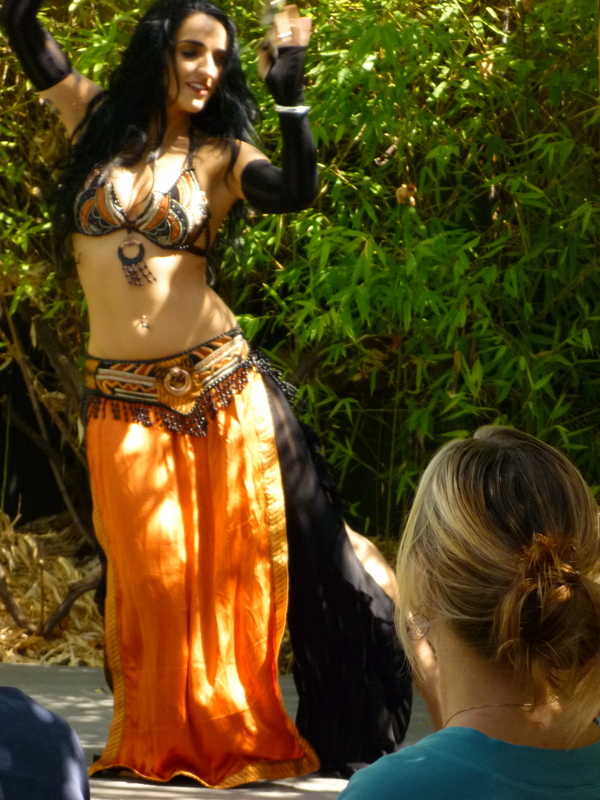 Crystal studied with Palika learning American Tribal Style bellydance and performing with Palika’s company, Heavy Hips. When Crystal moved to study Persian at UC Berkeley, Palika recommended both Jill Parker and Suhaila Salimpour. Crystal, with self-mocking humor, tells of her first few classes at the Salimpour school. When Crystal tells this story to her classes, she drops dramatically to her knees and bows deeply to the floor. Suhaila Salimpour became her master teacher and even when she moved back to Santa Cruz (again…Santa Cruz does that to people), she continued to commute to Salimpour’s school in Berkeley. Crystal has enormous respect for both Suhaila and Jamila and for how their work changed bellydance in America. The beauty of Salimpour’s technique, Crystal says, is that it gives you a vocabulary of movement that aids in the verbal and kinesthetic transmission of movement: it makes you a better teacher and performer. “She gives you a vocabulary, gives you a language for dance.” The technique—which focuses on the minute mechanics of bellydance movements—also freed her as a choreographer. As an artist with interests in a wide variety of dance styles, Salimpour technique provided her with a foundation that could be applied to other dance forms. I wanted to rebuild my technique. It was a lot of work. I felt like I was starting over…but I wanted to have more freedom to combine jazz foot work with glutt contractions. When you’re doing things from the knees and you’re pumping your knees, and you’re upper torso is a back here like with Tribal, I find that’s limiting in terms of what you can layer. Crystal didn’t start her own dance company deliberately but by a slow, “organic” evolution: at her student’s and friends requests, she choreographed solos and group pieces for various events. RaksArabi company members—Michelle Reynolds, Jill Baker, Jessica “GiGi” Helman, Jessica DelBono, Cecily Ryan and Amber Dratz—were selected for their high technical skill and their dedication to working as a company. How does she like being a choreographer? “I hate choreography!,” she cried. “It’s not natural for me at all. It’s quite painful.” Crystal “tends to want to work on every beat: one e and a two e and a… Just to get through an 8 count for me can take an hour.” I can personally attest to that tendency: I attended one of her final local workshops to learn her robotic “Apocolypse” choreography and it took us 2 hours to learn 2 minutes with hip, belly, shoulder and head gestures on every beat! As a soloist, Crystal works improvisationally in order to take advantage of how she is feeling the music in the moment of dancing. She provides her company members opportunities to develop their own solo choreographies. For their presentation of “Endangered Species,” Silmi linked their concern for planetary environmental dangers with dance. Her goal was to publicize the plight of endangered species by representing six of them in dance. Crystal made the selection of animals—polar bear, crow, grey wolf, et al—and paired them with the dancers she felt were most capable of expressing them. Each dancer conducted her own research on the animal and set out to embody and dance their spirits. Sadly, while Crystal is off on her adventure to Europe, RaksArabi will be on hiatus. Her dancers will moves on to new things, broadening their dance horizons and taking a break from the late-night rehearsals and long commutes (members of the company are scattered across three counties from the South Bay to Salinas). Crystal expressed great affection and appreciation for the Santa Cruz bellydance community, but its limitations are part of why she is seeking fresh soil in Europe. That and the realities of “getting older” and her general restlessness. Santa Cruz is a small town. I kind of see myself doing the same types of things over and over again as far as events go. And just … its scary; its dangerous; I have a job, I know I should be so thankful that I have a job, but I’m just, I’m not living. Even though when I am doing my shows I’m happy, I’m loving it; when I’m with my troupe I love it. But I’ve just had something inside me telling me its time to do something else. I came to Santa Cruz in ‘97 to go to college. I’ve been in and out, like I said I studied in India, I taught English in China, I spent a lot of time in and out; I even moved back to the East Bay at one point but got pulled back. I’ve worked in the corporate world, I bought a house, I’ve established a dance company, I’ve worked in all the great studios in Santa Cruz, I’ve done great things here…There’s not much more to do in Santa Cruz, unfortunately. So if you happen to find yourself in Madrid this summer, look for signs of Crystal’s performances and workshops. And say hello from Santa Cruz. This entry was posted in Bellydance and tagged Crepe Place, Crystal Silmi, Raks Arabi, Suhaila Salimpour. Bookmark the permalink. This is one of the best articles about Crystal Silmi and Belly Dance. It’s as if you have known her for a long time. Bravo to the writer, Renee Rothman!